Size: 1/2 " - 2 "
Sai Isolation Needle Valve, Size: 1/8" - 1"
· Vee tip design - Controls accurate flow. · Stem threads Rolled Hard Plated - Provides additional strength maximum service life. 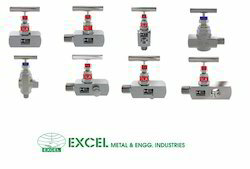 We ZeaL Engineers engage in manufacturing activity of industrial Valves for Water. Oik. Gas Chemicals Acid.